The least bad way to help Europe may be to dismantle Schengen. The 26-country free border zone is struggling to cope with refugees and security risks. Abolishing Schengen would be expensive, wouldn’t solve migration problems and would look like a U-turn on core European Union principles. Yet it might dampen the populism that threatens Europe’s economic integration. Like the euro, the Schengen zone that enables 400 million European citizens to travel without passports has proven incapable of coping with real world pressures. Schengen made it easier for citizens to travel and trade. But it lacked a proper system for protecting external borders in Greece, Italy or eastern Europe, or a system for re-housing asylum seekers. Its loose security arrangements look naïve in an era of homeland extremist attacks, like Paris on Nov. 13. And just like the euro, the ideal solution would be to have more Schengen, not less. That would mean policing external borders properly, sharing genuine asylum seekers equitably. It requires trust, cooperation and time. Instead, the region is going backwards: de facto, temporary borders are being erected, and there’s talk of ejecting countries that can’t observe Schengen rules. Abolishing or limiting Schengen would be damaging, but it is wrong to characterise it as a disaster for the European project. It would not impair European citizens’ rights to work or trade, nor stop them holidaying. It would create costs to monitor borders and transport goods. The Dutch Association for Transport and Logistics puts the cost for Dutch hauliers at 600 million euros. Given that Dutch truckers make up about 7 percent of transports across the region, the cost could be just shy of 9 billion euros. Some form of rowback on Schengen may become inevitable if the migration crisis can’t be tackled. Yet it would have some benefits. Chief among them is addressing the populist rhetoric in France, the UK and eastern Europe that sees any migration as a threat. British anti-Europeans, already outside of Schengen, may welcome signs that the region can police itself, and thereafter be more open to the other benefits of the union. Sure, showing one’s passport when crossing the EU is a drag, but worth it if the alternative is having no EU to cross in the first place. 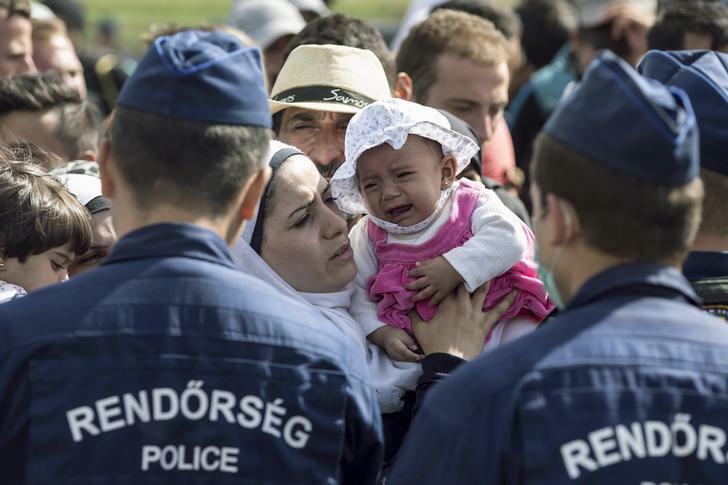 A migrant kisses a child who is crying as they stand in front of Hungarian police officers while waiting to board buses at a collection point in the village of Roszke, Hungary, September 7, 2015. Greece asked for European help on Dec. 3 to secure its borders, a move aimed to defuse threats by European Union leaders to suspend it from the Schengen passport-free zone, Reuters reported on Dec. 3. European Union interior ministers will meet on Dec. 4 to discuss whether to suspend the Schengen zone, the Financial Times reported earlier on Dec. 3. Ministers will discuss whether to invoke an Article 26, which would formally close one or more internal borders for up to two years, the Financial Times said.